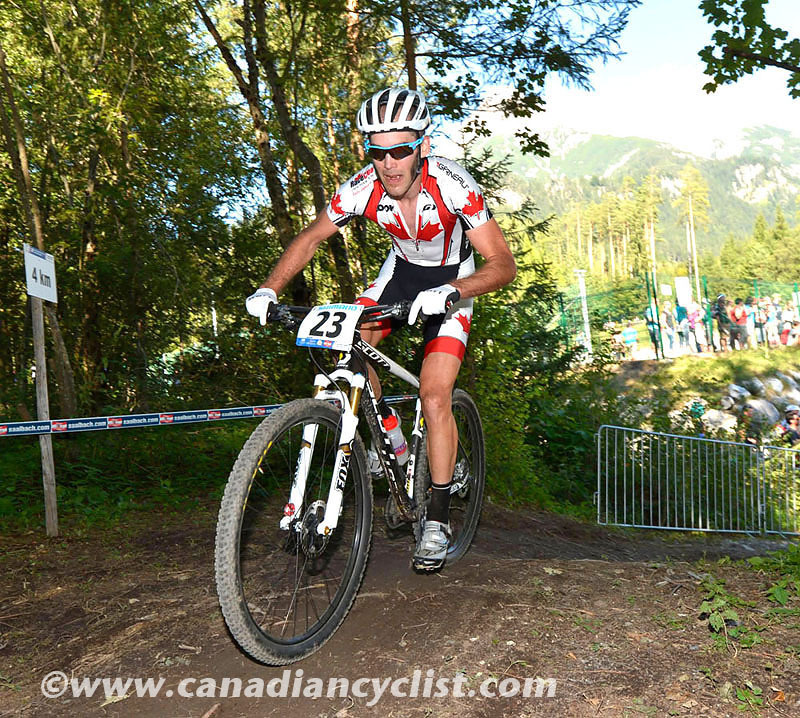 The Cross-country events at the Mountain Bike World Championships concluded on Saturday in Saalfelden, Austria, with the Junior men and the Elite races. 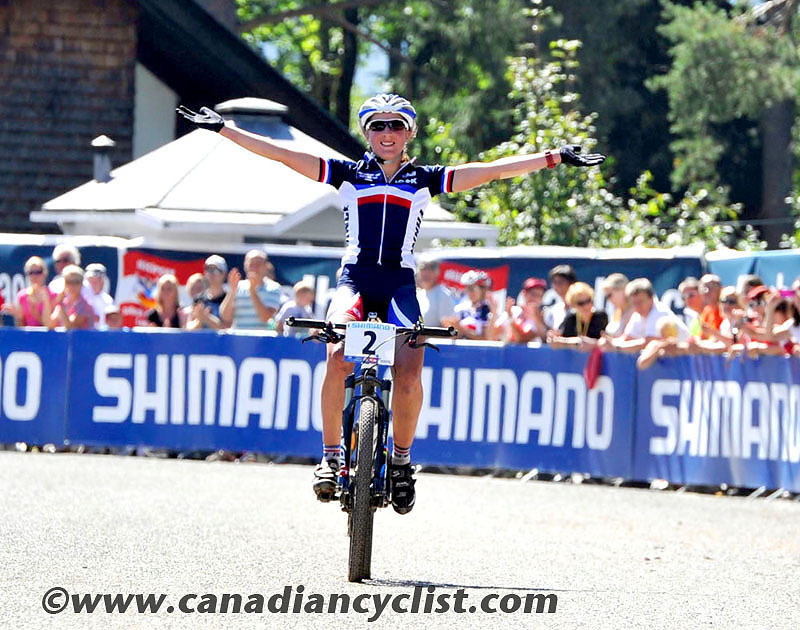 Olympic champion Julie Bresset (France) took the Elite women's title, while Nino Schurter led a Swiss sweep of the Elite men's podium. Pre-race favourite Anton Cooper crushed the Junior men's field, giving New Zealand its first ever mountain bike world title. Cooper has dominated Junior racing ever since he became old enough to participate in 2011, finishing second to Victor Koretzky (France) last year primarily due to mechanical problems. This year he left nothing to chance, attacking on the start loop of the five lap race and steadily opening a gap on Koretzky and his team mates Titouan Carod and Romain Seigle. The Kiwi rider soloed in 2:17 ahead of Koretzky to take the title, with Carod in third, Seigle fourth and American Keegan Swenson fifth. Cooper's pace would have likely put him on the podium in the Under 23 men's race. "One of my goals I set for this year was to win the world championships," said Cooper. "It's been a dream as a kid to win this thing. I'm finally satisfied. I felt relaxed. Everything just fell into place." 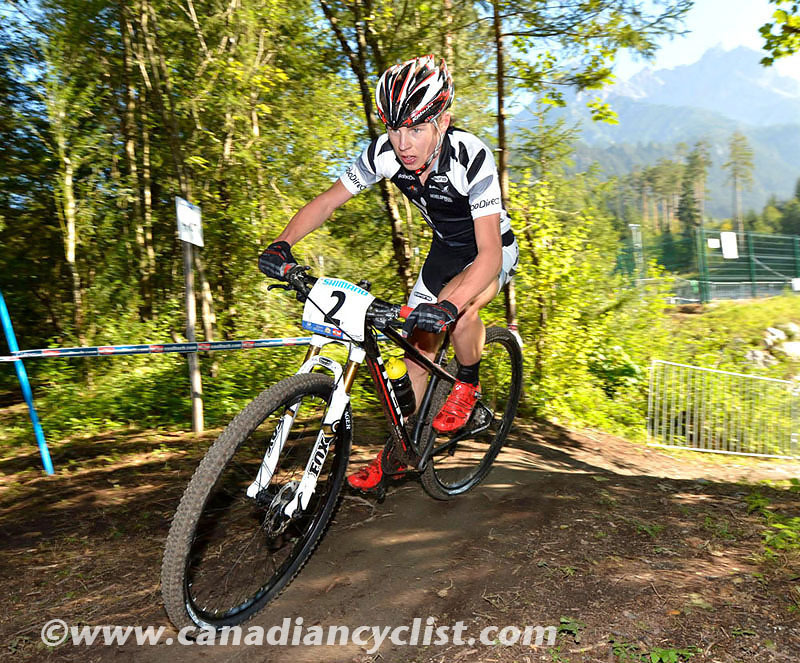 Canada's top Junior finisher was Marc-Antoine Nadon, in 33rd. 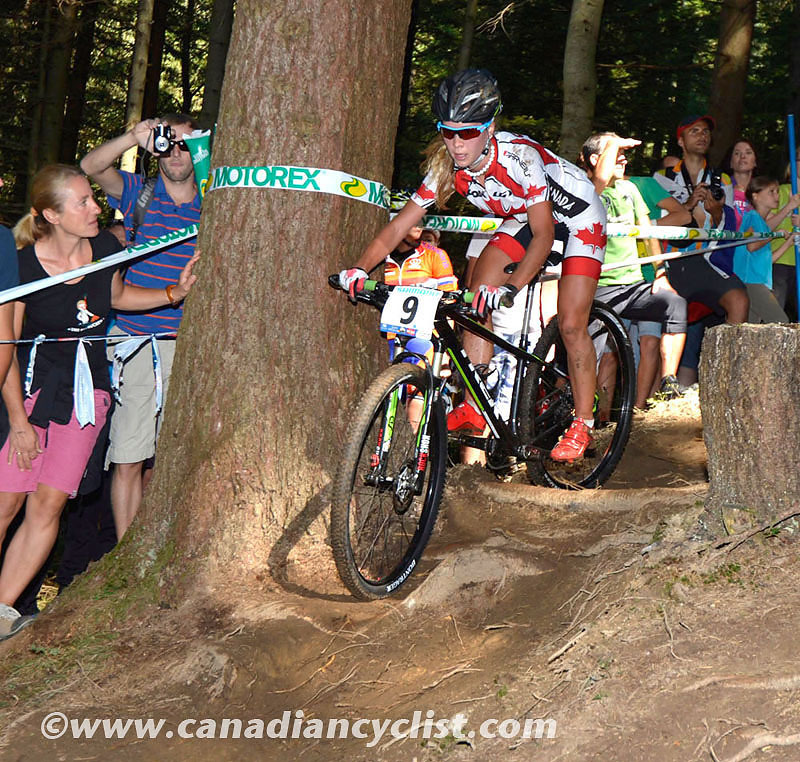 Nadon started well, in the top-15 after the start loop, but struggled in the middle part of the race. Bresset convincingly won the women's Olympic title in London four weeks ago, but the question was whether or not the media demands and emotional letdown after the Games would hinder her performance at the world championships? The answer was clearly no; as the first year Elite rider followed up her silver medal in the Team Relay on Thursday with the gold medal and rainbow jersey in the cross-country on Saturday. Bresset dropped Gunn-Rita Dahle Flesjaa (Norway), Eva Lechner (Italy) and Olympic silver medalist Sabine Spitz (Germany) on the first lap of the six lap race, and pulled away to take a rare double: the Olympic and world titles in the same year. 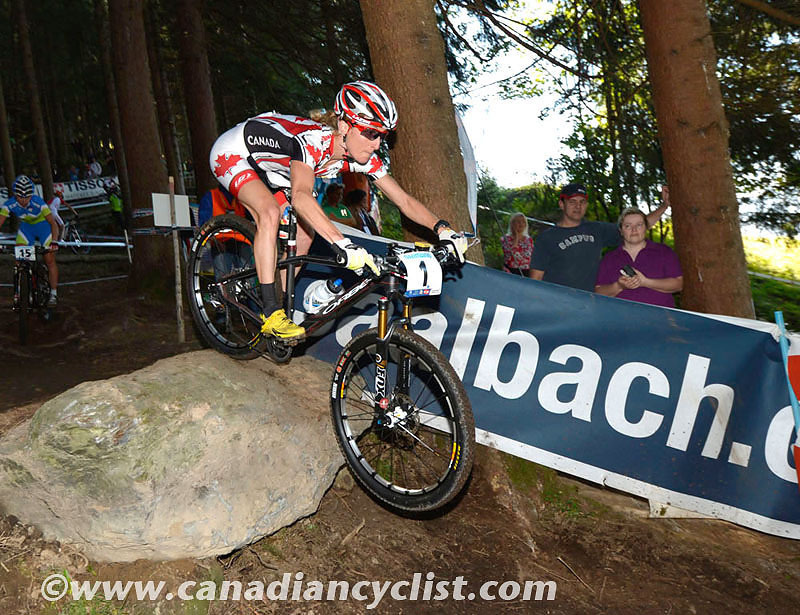 Behind, Dahle Flesjaa took sole possession of second place after Lechner crashed heavily in the first lap on the rock drop and then Spitz crashed on lap three, breaking a rim and requiring assistance in the tech zone, dropping her out of the top-ten; she eventually recovered to finish sixth. Bresset revealed that she had not done a lot of preparation for the world championships, due to post-Olympic obligations, and was happy that her form from the the Olympics had carried through. "Today I won my race in the technical section," she said. "When Sabine made a mistake in the technical section on the first lap, that's when I took over the lead. Later, I got ten seconds in the technical section and led from then on. The gold medal of a world champion is very amazing." The day concluded with the Elite men's eight lap race, and Schurter immediately took control after the start loop, attacking with Marco Fontana (Italy). Schurter and Fontana had taken silver and bronze respectively in London and, with the Olympic champion Jaroslav Kulhavy (Czech Republic) clearly not showing the same form as in London, rode clear of the field. Initially, they were joined by Schurter's Swiss team mate Fabian Giger, but he faded from the fierce pace halfway through the race, just as two other Swiss riders were moving forward, the Fluckiger brothers; Lukas and Mathias. Schurter dropped Fontana for good on lap five, and by the start of the final lap Lukas Fluckiger was clear in second, and his brother Mathias was in third. Behind, the two-time Olympic champion Julien Absalon (France) was mounting a late charge, moving ahead of Giger and Fontana into fourth, but finishing 13 seconds shy of catching Mathias Fluckiger. 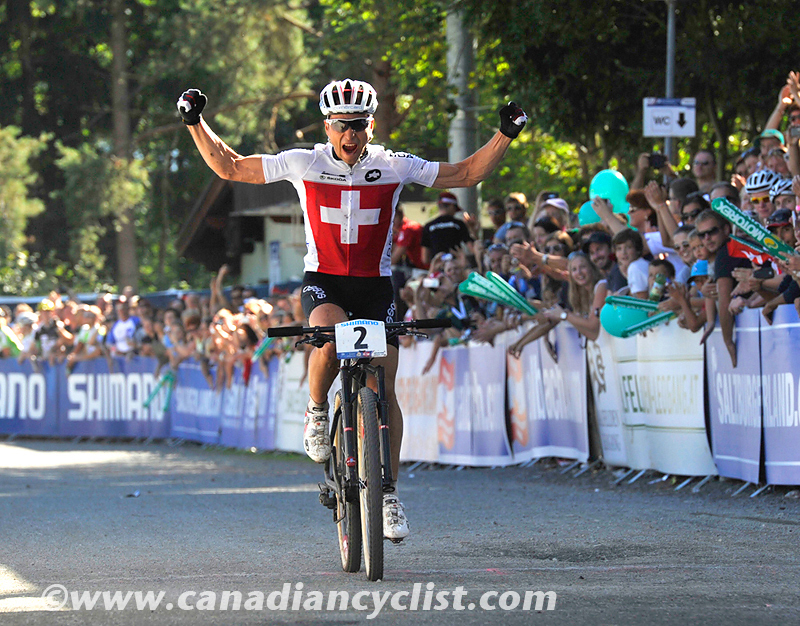 "It was my best season ever, and I'm happy," said Schurter. "I came into the race very relaxed, with no pressure. It's a great victory for Switzerland. I felt good today and had no problems." 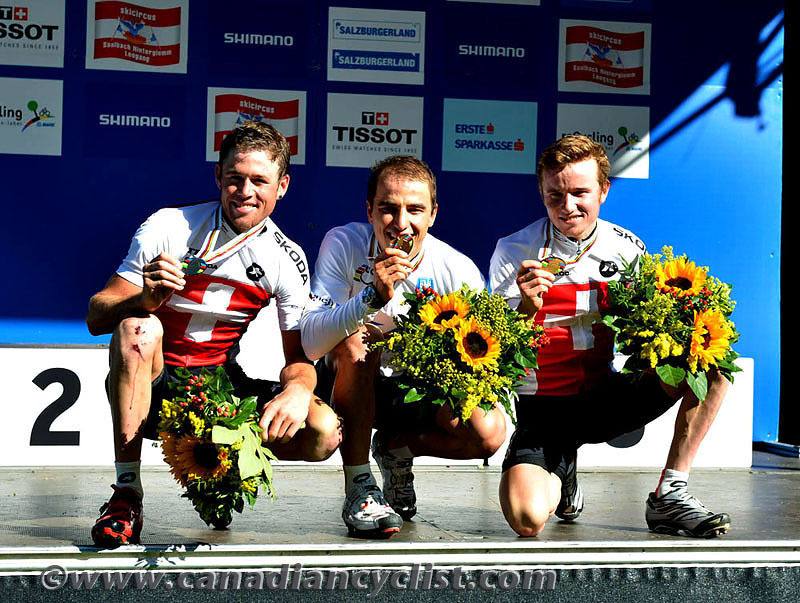 Following the Elite men's award ceremonies, two special presentations were made. First, Switzerland's Christoph Sauser, a former Cross-country and Marathon world champion, received a special rainbow jersey, recognizing his 20 consecutive world championships. Following that presentation, all of the Olympic mountain bike champions from 1996 to 2012 were presented to the spectators and the media.